« Grammar Giggle – When In Doubt, Use More Vowels! I was wandering through Target the other day and spotted this sign. Because I’m particularly sensitive to issues involving the apostrophe, those errors seem to jump out at me. This sign made me wonder if all adults share one birthday, because that is what the sign–as written–actually says. 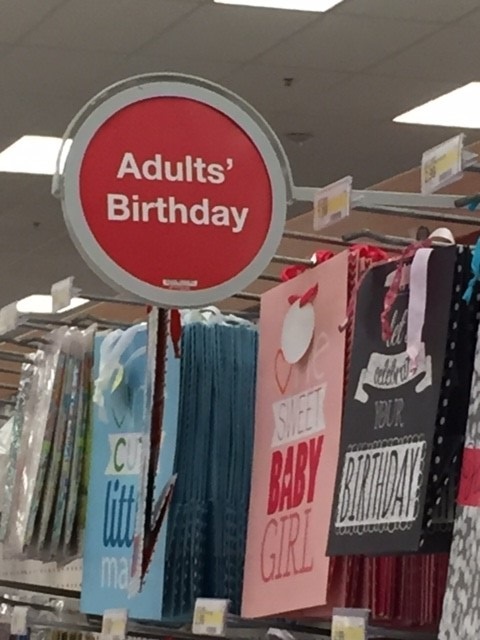 It should be “Adult’s Birthday” indicating the birthday belonging to an adult or, even easier, leave the apostrophe out and call it “Adult Birthday.” Really, Target?